I arrived on NOAA Ship Reuben Lasker on Wednesday, May 31st. However, we just left the Port of San Francisco last night (June 2nd) because the ship had to make sure everything was running properly and pass multiple inspections. Safety is a serious thing out here, and I appreciate that very much. 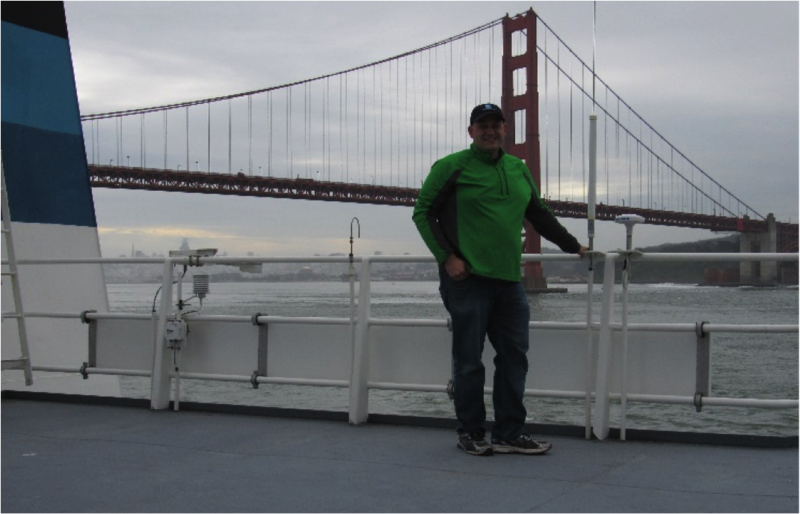 Once we had the green light, we sailed out of San Francisco Bay underneath the Golden Gate Bridge. The winds were about 25 knots (almost 29 mph) with 10 foot swells. Conditions like this are not ideal for data collection, so we sailed about 220 nautical miles to the South where conditions were more promising. I spent my first night on the job acclimating to the evening schedule. In that time, I learned about some of the equipment and programs we use to collect and analyze our catches and samples. The first thing that I noticed was a GPS system used to track the ship’s location and the locations for each trawl. 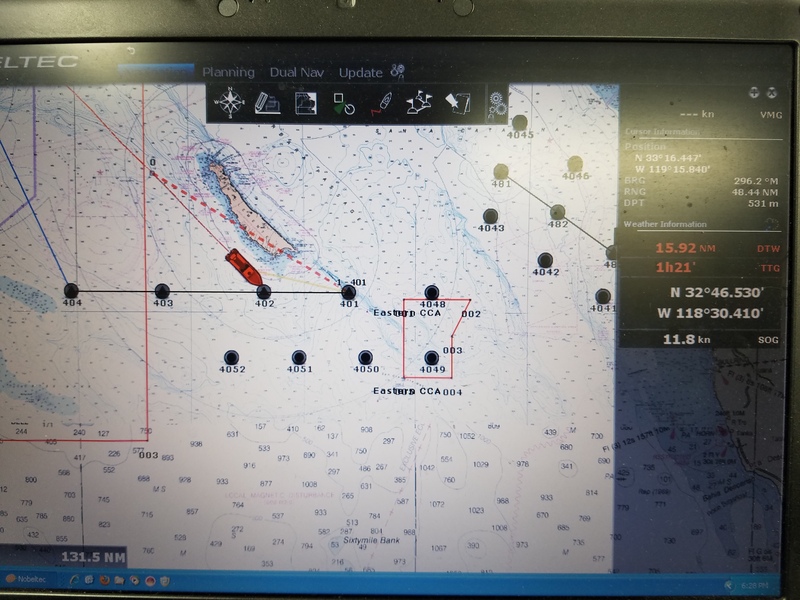 The boat icon shows the location of the ship, and the dots indicate locations where we plan to survey. Those with a triangle inside are the trawling locations, while the others indicate spots where we need to perform CTD tests. This systems marks locations using latitude and longitude, and can provide an estimated time of arrival. GPS Program used to plot survey points and map the location of the ship in real time. What are the responsibilities of the Survey Technician? The Survey Technician is responsible for data management. All the data collected on the ship is recorded in the Scientific Computer System Database. This includes data from the thermometers, anemometer (wind speed), TSG (thermosalinograph), fluorometer, etc. The data is organized and then delivered as a data package to the scientists. There are two major types of files, continuous files and snapshot files. A continuous file may include data that is taken every 30 seconds, like latitude and longitude, speed over ground, course over ground, etc. A snapshot file provides information about a very specific event. For example, their system records every single step in the trawling process, including the moment the net hits the water, “shooting the doors” that hold the net open, begin fishing, and then every step in the return of that process. While this is happening, all the environmental parameters are simultaneously and continuously being recorded. Jackie maintains these files until the end of a survey and then gives the data to the chief scientist in a document known as the MOA, or the Marine Operations Abstract. The information is also sent to the National Center for Environmental Information, the world’s largest active archive of environmental data. These archives are available to the public. This is the continuous system that records conditions in the water, such as conductivity, temperature, and more. This is done every 30 seconds. This component tracks each individual step of any activity we do on the ship during a survey. Why did you apply to work for NOAA? At first, I didn’t know what NOAA was. I originally wanted to study things like Marine Biology, Astronomy, and Physics. I was attending the Borough of Manhattan Community College as a liberal arts major. I planned to transfer to another school for Physics and Astronomy, but my counselor suggested another option, knowing my interest in Marine Science. I then went to SUNY Maritime in the Bronx to study Marine Environmental Science (State University of New York), a school I never knew existed considering I lived right down from the street from it. Upon graduation, I received an email from a former classmate also working for NOAA, stating that NOAA was seeking Maritime Majors for this position. She gave me a contact, I sent my resume, and I got the job. What is the most important tool you need to do your job? The SCS is the most important thing I need, and am fortunate that NOAA Ship Reuben Lasker has up-to-date, top-of-the-line equipment. We are one of the most technologically advanced ships in the world. We also have back-ups for almost everything on board which is nice to have while at Sea. What advice would you give to someone interested in pursuing this position as a career? Being a Survey Technician requires you to have a degree in science. Be certain that if you apply for a position, be sure to know what you are applying for. Much of my training was on the job training, and I was fortunate to work with Phil White, Chief Survey Technician with years of experience. I learned a lot from him. Phil also developed course for those wanting and needing to learn the ins and outs of a Survey Technician. If you didn’t work for NOAA, what career would you choose? Working in Astronomy or Physics because I had a strong interest in both. However, I would say that joining NOAA was one of the best decisions I ever made. I came from a rough background growing up, and now I get to experience things I never would have imagined. NOAA provides an acceptable salary, nice benefits, leave time, vacation time, and paid overtime. When I take leave, I travel to other countries. This is something I always wanted to do. I love trying new foods when we go in port. I love drawing, painting, and playing video games. And I love to travel. I’ve already been to Egypt, Qatar, Europe. In the next year for two occasions, I plant to travel to Italy, then [for my honeymoon] to Vietnam, Cambodia, Thailand, and the Maldives. Analyzing data can be a daunting task. “R,” a coding language used for statistical computing and graphics, allows scientists to analyze their data in a variety of ways. The program can be used to perform statistical computations of large amounts of data to show underlying patterns and trends. It can also be used to create plots of specific sects of data if one wanted to highlight a location or time. Many scientists like this program because it is very user friendly, and if one needs help with a program (code), there is a free and open community of users available to provide advice and feedback. When I arrived at the NOAA Ship Reuben Lasker, we expected to sail on May 31st. However, we were delayed in port for 2 extra days, officially leaving port on June 2nd. During the waiting period, I explored the piers along the Embarcadero. 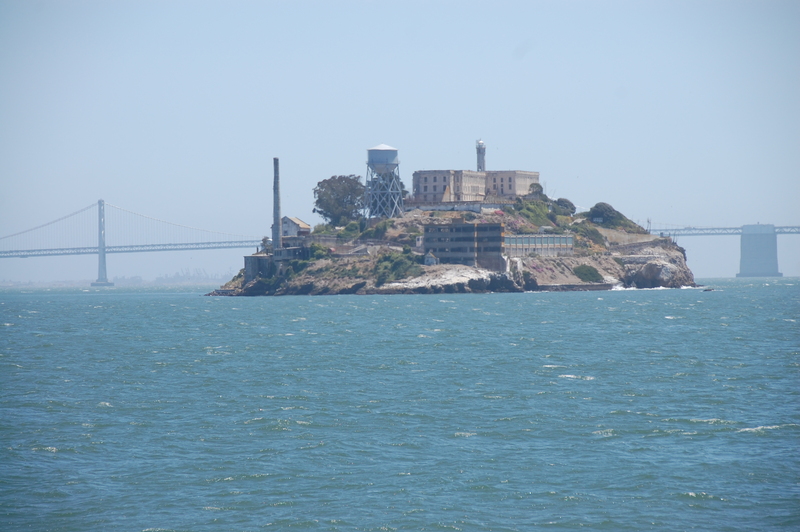 I had the chance to visit the Exploratorium, the Bay Aquarium, and the famous Pier 39. 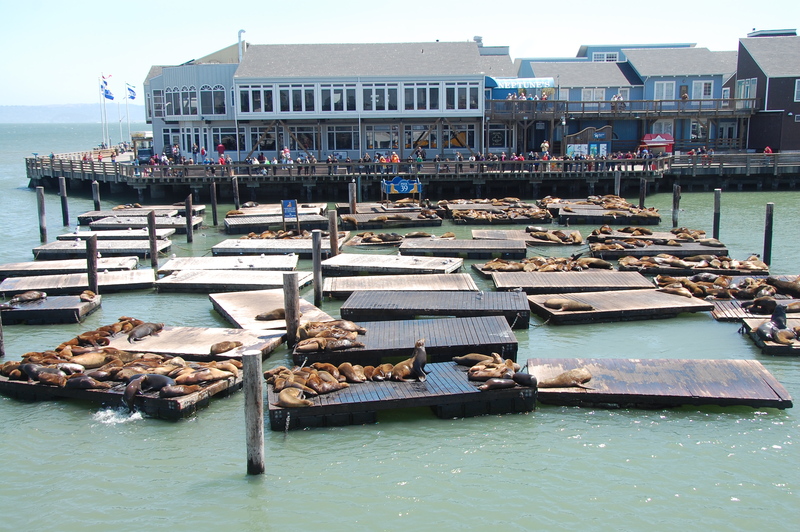 Pier 39 is where the Sea lions aggregate every day and, apparently, have been doing so for 28 years. 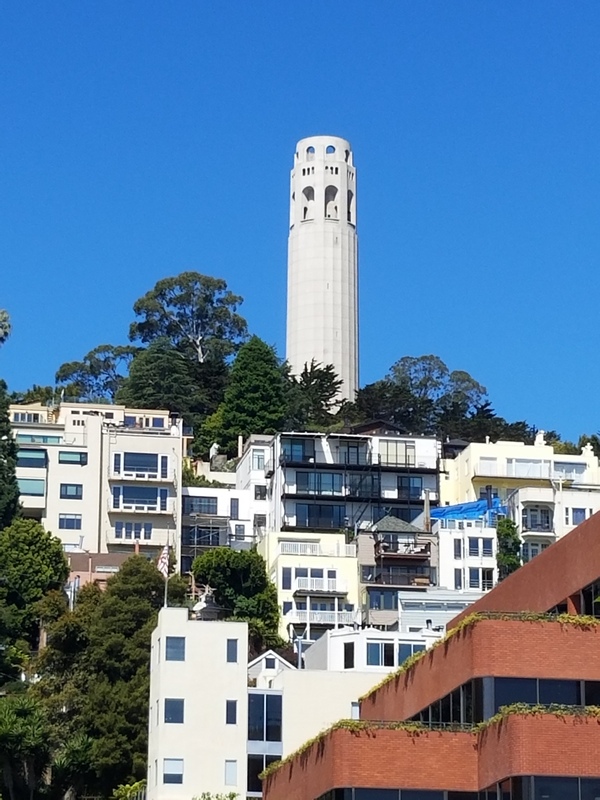 I hiked up the stairs to Coit Tower, a historic landmark built in 1933 (Lillian Hitchcock Coit, a rich socialite, bequeathed over $100,000 back in 1929 to restore and beautify sections of San Francisco). Hey WINS girls, remember how we climb the steps coming out of Tumbling Waters, and how you felt like you were going to die before you reached the top…I almost died twice climbing those stairs! By the second time it was easier. When on the ship, I would read or sit out on deck and watch the pelicans, gulls, cormorants, terns, and common murres. I also got to do a little bird watching heading to Coit Tower, where I saw lots of Anna’s humming birds, chestnut-backed chickadees, and song sparrows. It was interesting because I don’t recognize the calls of west coast birds. Even the song sparrow, which are also common Philadelphia, have a variation in their song, like an accent or a dialect. As of June 2nd, we have been out to sea. I’ve been assigned to night shift, which means I will be working a lot on sorting the overnight hauls (Stay tuned for the next blog). However, the weather leaving the bay on the first night was rough, so we sailed south to find calmer waters. I didn’t mind so much because as soon as we passed the Golden Gate Bridge, I got to see something I wanted to see my whole life, humpback whales! It was worth the wait. If you think about a famous quote about the ocean, this one might be one of the first you would think of. It is from “The Rime of the Ancient Mariner” by Samuel Taylor Coleridge. I don’t know the first time I heard that quote, but it gave me a view of the ocean as a foreboding place. People like to use quotes to capture a thought or a feeling or an idea that someone else said near perfect. It is a way of remembering ideas of others and being remembered. It is also a way to communicate a deep truth in a memorable fashion. If said well, the quote rings in someone’s head. The greatest technology a scientist has is their ability to communicate to the public their science. All the measurements in the world, the most exacting procedures, and the best control of variables die on the hard drive if they are not effectively communicated and shared with others. Said well, it will ring in the head of the recipient. If you have a career or are retired, you can think back to the path that took you to one of the most important aspect of your life. The people, opportunities, experiences, dreams, or something else that inspired you to take the career you chose. If you are in school, you are being exposed to influential people, ideas, and values that will shape your life. I have to say, the best aspect of this fisheries expedition has been the amazing and inspirational people I have met along the way. The group of people that were on the Reuben Lasker cover a large span of skill sets that are critical to run a long term research trip. From the NOAA Corps, to the ship operations, to maintaining the complex systems of the ship, to deploying the scientific equipment from the deck, to the planning, conducting, and evaluating the results of the science, everyone brings to the table their invaluable contributions. I have not thus far been associated with such an endeavor and I thank everyone for sharing their expertise with me. I asked the scientists I worked with three simple questions to get an understanding of the events that took them down the path to their career with NOAA. I’m sure you can relate to these stories and have stories of your own that have brought you to your career. If you still have many big decisions ahead of you, maybe you can use this as a sign post to reflect upon as you move along your path. Below is a picture of the scientists I had the privilege to learn from, work with, and share an amazing experience. How did you become a NOAA scientist? I was working at Hubbs Marine Research as a laboratory manager prior to coming to NOAA. A group of us had started what turned out to be a long term project combining aquaculture and natural population enhancement known as OREHAP. One of the aspects of the OREHAP project was describing the micro-habitats of Mission Bay and San Diego Bay. Many days were spent in the field sampling the various habitats of each bay. One of the scientists that would join us on occasion was Sharon Kramer. At the time Sharon was working on her PhD from Scripps and was also an employee of NOAA’s Southwest Fisheries Science Center. Sharon alerted me of an opening at the center working for the Coastal Fisheries Resources Division headed up by Rich Charter, one of the best supervisors she had known, and I agree. The rest is history. I’ve now been with NOAA for 27 years; most of them spent at sea and have experienced sights that many people may only read about. No regrets whatsoever. This is probably one of the easier questions. What I like and cherish most about my career is the people I have had the privilege to know and work with. Not only some of the best scientists in the world but just good people. The world of marine science, especially fishery science, is a relatively small community. They become your family. Throw into the mix that I also get to do something that I have wanted to do since high school and I realize that it wasn’t a bad choice. What advice would you give to a student who would like to follow a similar career path? In your early academic life, keep an open mind. There are so many aspects to science that you may not realize until you begin your formal education. Take a look at everything. I spent a short time at a city college exploring various avenues before making my commitment to a four year university. If you can, volunteer. It is definitely not time wasted. For a career in science, earn the highest degree or degrees you possibly can. And lastly, a major component of a career in science is being able to communicate. Learn to write well. I have found that an excellent way to improve your writing is to read. Read everything. Read novels, magazines, journals, newspapers, whatever you can get your hands on and never stop. Growing up, I loved mysteries and figuring out why things worked the way they did. I was also fascinated by the marine environment. Having learned about NOAA and its missions from relatives, I participated in a co-op program while in college where I worked at a NOAA Fisheries lab. That work experience helped me realize that this was a field I would like to make a career. I would definitely have to say the challenge of the work. The marine environment is so dynamic and ever changing and evolving. Working with so many amazing scientists to better understand this environment and the organisms in it is very fulfilling. If this is a career path a student is interested in, I recommend looking into volunteer and internship positions. These experiences help get an understanding of the work in this career and if it’s a right fit for you. It also helps to build your experience and make contacts in this field. I graduated from Michigan State University with a BS in Fisheries Biology. After graduation, I joined Peace Corps and worked for 3 years on the aquaculture program in the Dominican Republic. Upon my return to the states, I applied for and was accepted as a sea-going technician for NOAA at the Southwest Fisheries Science Center in San Diego. I have been an employee here since 1989. What I like best about my job is the variety of tasks I perform. I was looking for a career where my job was outdoors and physical. I spend 1/3 of the year working on fisheries research vessels. I process trawl catches and assist in oceanographic sampling. In the past, I have been a marine mammal observer on a tuna boat, and have tagged sharks. The rest of the time I work in an office processing data and prepping gear for our next research survey. My advice for someone who would like to follow a similar career path would be to go beyond a BS and get a Master’s. I recommend taking all the math classes, computer classes and writing classes that are available to supplement whatever field of Science one chooses. After receiving undergraduate degrees in oceanography and zoology from the University of Washington I went to the University of Hawaii to do a master’s degree working on distributional ecology of fish eggs and larvae. While at UH I visited the larval fish laboratory at the NMFS Southwest Fisheries Center in La Jolla, California, to meet the staff and learn what I could to improve my skill in identifying fish eggs and larvae. I subsequently stayed in touch with the SWC larval fish lab while working first at UH, then for North Carolina State University doing biological monitoring studies at a coastal nuclear power plant as well as ecological studies of fish and shrimp larvae in an estuary and adjacent salt marshes, and then in southern California for a consulting company doing a wide variety of mainly coastal biological studies. While at the consulting company I received a call from the supervisor of the SWC larval fish group letting me know that a vacancy was coming up in the group and to keep an eye out for the job announcement if I was interested. When the announcement came out I applied, and got the job. Interestingly, the person I replaced was the person I started my larval fish career with in Hawaii 20 years earlier. I like fish larvae, so having the opportunity to go to sea to collect samples, and being able to spend part of my time in the laboratory looking at fish eggs and larvae through a microscope often are as much entertainment as work. In addition to the routine sample processing that we do in support of biomass estimations for commercially important fishes, we regularly conduct analyses to look at how the California Current ecosystem functions from a fish perspective. We can do this because most fish species in our area have planktonic larval stages, so with one set of samples we can look at fish assemblages ranging from deep-sea meso- and bathypelagic fishes to rocky reef and shorefishes. In recent years we have added genetic tools to improve our taxonomic resolution, and have added squids to our repertoire. Most of the studies done in my lab are group efforts, in many cases in cooperation with universities and other NOAA Fisheries labs. I always tell student interns in our lab that if they plan to be scientists, they need to pay attention in English classes. Research isn’t really done until it’s published, and if a manuscript is poorly written the likelihood is that it will be rejected by scientific journals. Writing is actually one of the more important skills to develop for someone interested in a career in science. Beyond paying attention in English classes, a postgraduate degree is almost a requirement these days to have any chance at doing independent research. Getting some real world work experience between undergrad and graduate school can be useful to help in setting a career course that you will be happy with, for example when I graduated from UW I planned to specialize in algology, but during a postgraduate internship working on the effects of tritium exposure on early development of rainbow trout, I discovered that I liked fish better and have been doing that ever since. My career path with NOAA began during my junior year in college. I had been volunteering at the Seattle Aquarium for several years and decided to apply for an internship opportunity that was collaboration between the University of Washington and the NWFSC working with phytoplankton. I wasn’t sure if I wanted to work with plankton, but I ended up loving it and was offered a contracting position when my internship was up. In 2014 I ended up moving to San Diego, and thanks to some connections I had from the NWFSC I was referred to a position working with ichthyoplankton (larval stage of fishes). I love getting to work with fish and see all the diversity the ocean has to offer. I‘ve also had the opportunity to conduct an egg rearing experiment where I get to raise fish eggs to larvae at sea and in the lab. While it presents many challenges, it is such a great feeling to be able to do hands research in the field. Once you start working on one question, you realize there are so many unknowns out there and it is exciting to get to be a part of a team that is trying to find the answers. The best advice I could give to someone who wants to get into a career with marine sciences is to volunteer. There are usually many opportunities associated with local aquariums, NOAA or University vessels, and research laboratories. These are a great way to experience the different avenues of marine science and provide a lot of valuable experiences and connections with individuals in the field. It is also a great way to find what areas you are most passionate about as well as discovering what fields aren’t the best fits. Contemplating a successful fishing voyage as we sail under the Golden Gate Bridge. As the boat motors under the Golden Gate Bridge and into the port of San Francisco, I think about how this experience will impact me. How can I take what I have learned and effectively communicate to my students the importance of researching how our planet functions? How will the planet change in the face of growing stressors from impacts of human population growth? How can I motivate others around me to be mindful of our impacts and to work towards a more sustainable future? Well, with any great study, you generally end up with more questions than answers. I thank my friends from the Reuben Lasker for helping me communicate to others about the ocean, their science careers, and marine sciences in general. Arrival to port at the Exploratorium in San Francisco! For hope and encouragement I turned to my students for quotes of their own. What quote would you use to describe your perspective on the world as you finish up school? Last night/this morning, we did our first two trawls. These two trawls were kind of “blind” because they had not started doing acoustic trawls. I think I am starting to get the hang of how things happen during a trawl, which I know will be put to the test tonight. As the net is pulled in, a team goes out and removes the camera from the net. The camera is used to monitor the net during the trawl, as well as monitoring the MMED (Marine Mammal Excluder Device) which records animals and their condition as they encounter the metal bars and are excluded through the opening in the top portion of the net. The deck crew continues to pull in the net. The organisms collected in the end of the net are put into buckets and brought into the wet lab. The first trawl had a small sunfish in the catch, but I missed it because I was putting my foul-weather gear on. The organisms are dumped onto a table and sorted. After sorting, the organisms are put on the scale and the mass is recorded. The number and type of fish were recorded. Both trawls had mostly pyrosomes (a colonial tunicate) and market squid. I have taught about tunicates in my zoology class, but never knew they were so common in the Pacific Ocean. Other than the pyrosomes and squid, the two trawls contained some lantern fish, several red pelagic crabs, and some other very small fish as well as a moon jelly. Since we had no sardines or anchovies to process, we focused our time on the market squid. 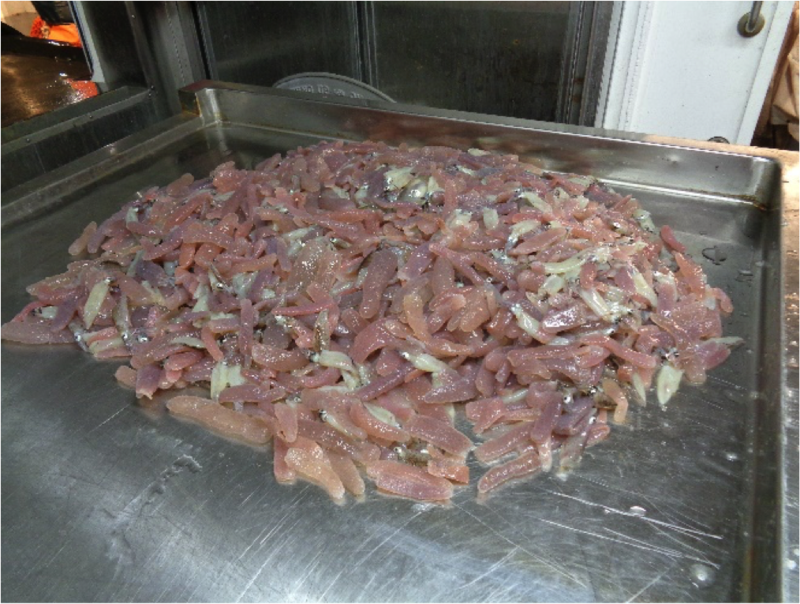 A random sample of 50 squid are taken. For each squid, we measure the length of the mantle, place the squid on a balance and record the mass. If the squid were larger than 75 mm, the squid was given a tag and placed in a bag. The squid smaller than 75 mm are all placed together in a bag. It was impressive how all team members got right to work and functioned like a well-oiled machine. I am also impressed with how all individuals think of safety first. Starting at sunrise, they began doing acoustic trawls, so we may have better luck catching sardines and anchovies tonight. I have enjoyed my first days on the Reuben Lasker. The crew and science team have been very accommodating and welcoming. I am trying to be helpful and not get in the way. My roommate is a UAS drone pilot, but the weather has not been good enough to fly today – it is quite foggy and rainy and the seas are choppy. I hope I get a chance to see it fly sometime soon. I am trying to get used to the sleeping schedule and since I couldn’t sleep this morning, I took a little tour today and went to the bridge and spoke to some of the crew on the bridge as well as the Commanding Officer (CO). They showed me around a little and described some of the different navigational equipment. The chief electrician showed me around the computers in the acoustic lab. It is crazy to see all of the technology and to hear about how they handle all of this data with limited internet access on the boat. I am so pleased that everyone was been so friendly. The food has been great (we had an incredible crème brulee last night) and I have not been sea sick so far. Pyrosomes are colonies of hundreds of individuals known as zooids. These zooids are joined by a gelatinous tunic and work in unison to propel the colony through the water. My name is Sandra Camp, and I teach math and science to 5th graders at Robert Louis Stevenson Elementary School in the Sunset neighborhood of San Francisco in northern California. San Francisco is located on a peninsula, which means it is surrounded by water on three sides. On the eastern part of the city lies San Francisco Bay. The western side is bordered by the Pacific Ocean. 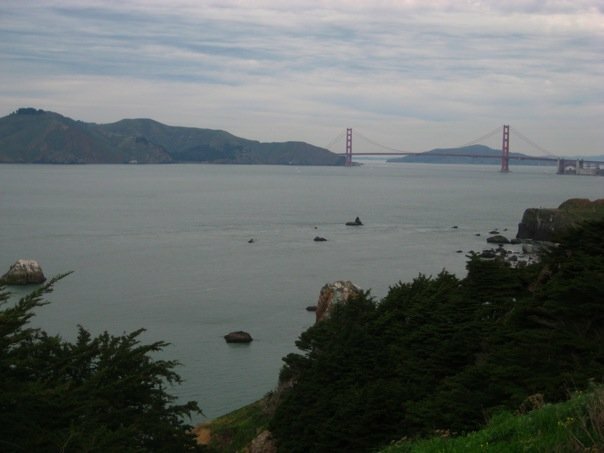 The famous Golden Gate Bridge spans the divide between these two large and important bodies of water. The Pacific is sometimes called the “Mother of all Oceans” because it is the largest ocean on our planet. Although we have many beautiful beaches here, in San Francisco the Pacific Ocean is much too cold for humans to swim in. 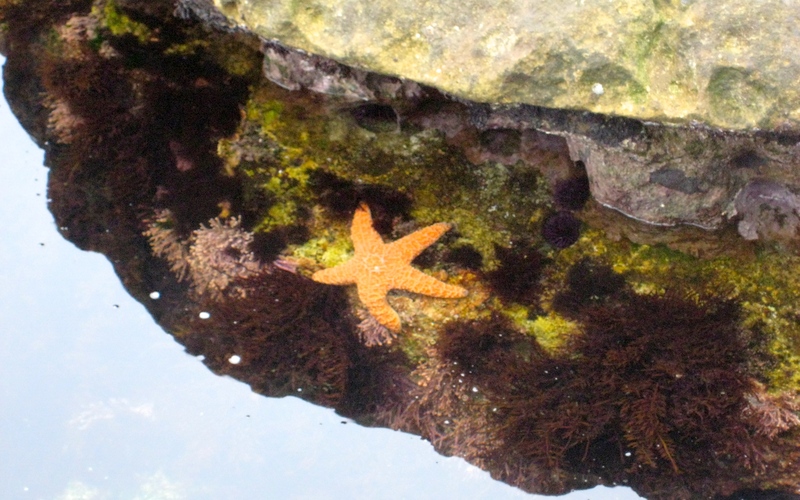 Even though I can’t swim in it, I do love to go tide pooling along the Pacific Ocean, looking for tiny sea creatures when the tide goes out like sea stars, crabs, and anemones. Being surrounded by so much water makes us care a great deal about the health of the world’s oceans and the plants and animals that live there. 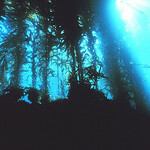 In our part of the Pacific Ocean, there are giant kelp forests. We are also home to many different kinds of marine animals, such as sea otters, harbor seals, elephant seals, crabs, sea lions, bat rays, and sharks. When there are healthy populations of these creatures living off the coast of northern California, it indicates that our part of the Pacific Ocean is healthy. I am very excited, because in about a week I will be visiting a different part of the Pacific Ocean, a part where the ocean is warm enough to swim in! Hawaii is a chain of islands located in the northern Pacific Ocean. Unlike San Francisco, islands are surrounded on all sides by water, and because the ocean water there is warmer, it allows coral reefs to grow. 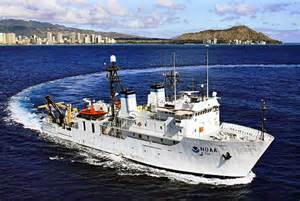 I will be flying to Honolulu, Hawaii where I will board the NOAA (National Oceanic and Atmospheric Administration) Ship Hi’ialakai at its home port in Pearl Harbor. Do any of you know what Pearl Harbor is famous for? If so, write your answer to me in the comments section of this blog. As a Teacher at Sea, I will spend 10 days aboard the ship while scientists conduct reef fish surveys around the main Hawaiian Islands. 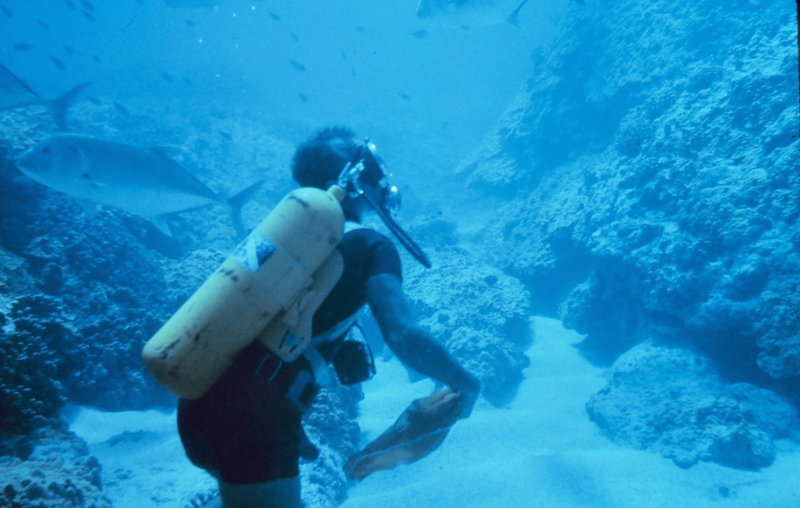 This means that they will be studying the fish that normally live in the coral reefs around the islands. If there are healthy populations of these fish in the reefs, then that means the coral reefs are healthy. If not, then that indicates the reefs are having problems. Here is a picture of the Hi’ialakai. Its name means “embracing pathways to the sea” in Hawaiian. It takes a lot of people to run a ship this big. Stay tuned, because in addition to the scientists, I will introduce some of the people who work aboard the ship to you in my upcoming blogs. What exactly is a coral reef, anyway? Coral reefs are ecosystems located in warm, shallow ocean water that are home to a very diverse amount of sea creatures, including fish, crabs, turtles, octopus, sharks, eels, and shrimp. Reefs are structures that are made from the skeletons of colonies of tiny animals called coral. 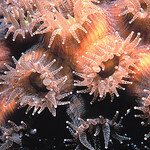 The individual animals that make up the colonies are called polyps. Polyps usually have a cylindrical-shaped body with a mouth surrounded by tentacles at one end. The polyps use these tentacles to catch tiny animals that drift by called zooplankton, which they eat for food. The coral polyps have a symbiotic relationship with algae. The algae help corals build their skeletons, and the corals provide the algae with protection and compounds they need for photosynthesis. Coral reefs are the largest structures built by animals on Earth! Sadly, coral reefs around the world are in danger because of human factors like pollution, over-fishing, and global warming. 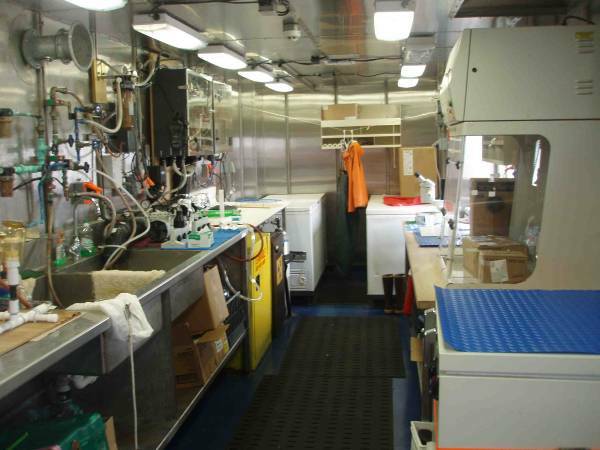 Most of the scientific work aboard the Hi’ialakai will be conducted by scientists who are scuba diving. While they are under the water, scientists can take pictures of the ocean floor and the coral reefs, as well as count the number of reef fish they find. 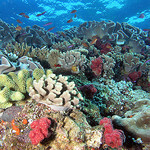 The information they gather will help them determine if the reefs around Hawaii are healthy places for animals to live. I will be sharing a lot more about the work they do with you in the blogs I write while I am aboard the Hi’ialakai. The Great Barrier Reef off the coast of Australia is over 1400 miles long! Even though coral reefs are the largest structures built by animals and are home to so many diverse species, they cover less than one percent of the ocean floor. Early Monday I flew out of Philadelphia and landed a few hours later on the west coast—a trip that would have taken the pioneer settlers a half a year or more to accomplish. The first leg of my flight landed in Los Angeles, followed by a short hop up north to San Francisco. The plane followed the California coastline nearly the entire time. I found myself mesmerized by the Pacific Ocean as it hugged the shoreline as if to embrace the homes that dotted the land. I had spent many years of my youth growing up in San Diego, and watching the water brought back many memories of lazy summer days complete with gritty sandwiches and sunburned skin. My first night in San Francisco was spent in a hotel near the airport; yesterday morning I took an expensive (nearly $60!!!) taxi cab to my current accommodation. I was lucky—the hotel had a room free early in the morning so I dumped my bag and went exploring. 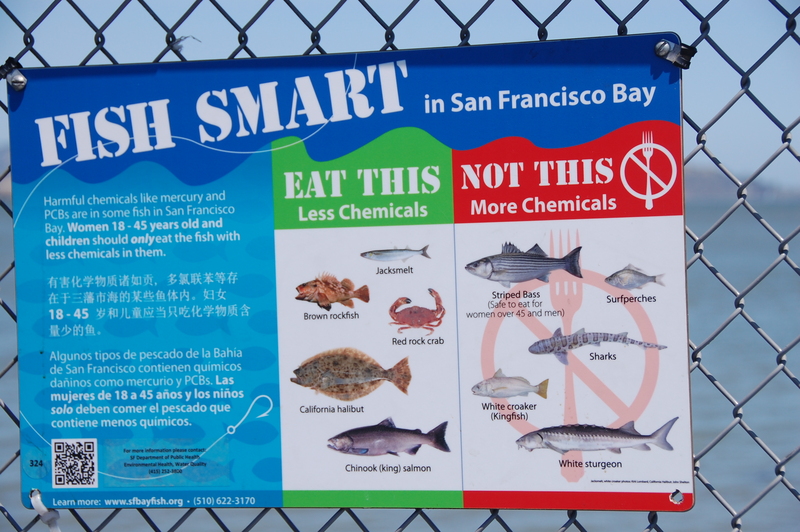 It was only a short walk to Fisherman’s Wharf—the place where San Francisco fisherman have historically unloaded their catch—most notably the Dungeness crab. The crab gets its name from a town in Washington where it was first harvested (although I didn’t have an opportunity to taste the crab, I wondered how it compares to the Chesapeake Blue Crab). Although the sun was out, I found it was a mere deception once I got close to the water. The air temperatures were in the 50’s and the wind was blustery at times. Up and down the waterfront are numbered piers; I walked down to Pier 33 in hopes of buying a ticket to Alcatraz Island. Alcatraz, or the “The Rock” is quite visible from the Fisherman’s Wharf area. Although many know it as a famous prison, it has also been a Civil War fort and was home to the first lighthouse on the west coast. The only way to get onto the island, which is managed by the National Park Service, is by purchasing a ticket through a ferry company. Despite it being midweek and not quite summer, all the tickets had been sold out for the entire day. Disappointed, I trudged down towards Pier 39—a famous tourist attraction. 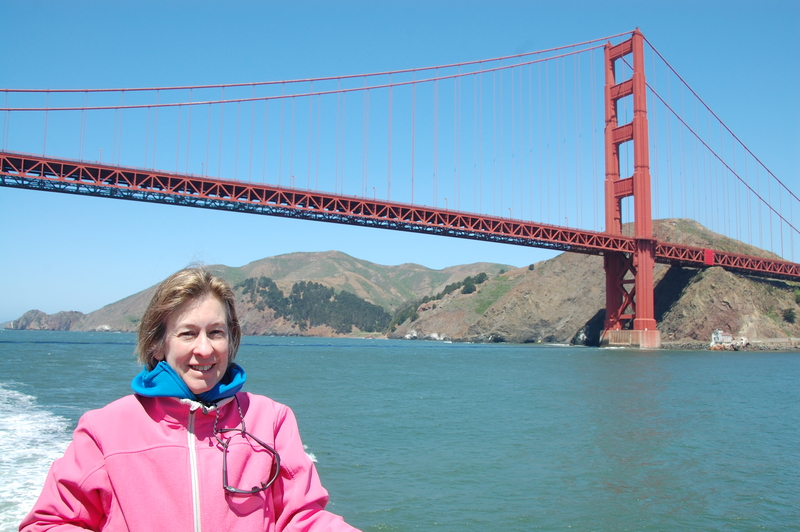 I settled for a tour of the bay, which included a good look at both the Golden Gate Bridge and the San Francisco-Oakland Bay Bridge. Both are engineering marvels. The Bay Bridge, which opened in 1936, is actually a double-decker bridge that is part suspension bridge and part cantilever bridge. Originally the top deck was for cars and the bottom deck was for trains and trucks but now cars can travel on both levels. The Golden Gate Bridge is a suspension bridge that opened in 1937. It is possible to walk across the bridge and today was no exception. As our boat passed under the bridge, I could see people waving at us from high above. Our boat had a loud speaker that provided interesting information about the history of San Francisco, but the noise from the wind made it difficult to make out what was being said. Our boat was rocked around by the wind and swells, making me wonder what the water outside the relative shelter of the bay was doing. I do know that rough seas have changed the location where I’ll be boarding the Ocean Starr. Later today I’ll be picked up and driven to Santa Cruz, a town south of here that lies along the Monterey Bay. While on the tour of the San Francisco Bay, I learned about Angel Island—a quiet wildlife area that is a California state park only accessible by ferry. I found the lure of visiting a relatively uninhabited area after the hustle and bustle of Fisherman’s Wharf too strong to ignore. Interested in doing a little hiking, I grabbed an afternoon ferry over to the island and was delighted by the unusual plant life and the opportunity to listen to waves crashing against the shore (check out the Angelcam for a view from the Visitors center). 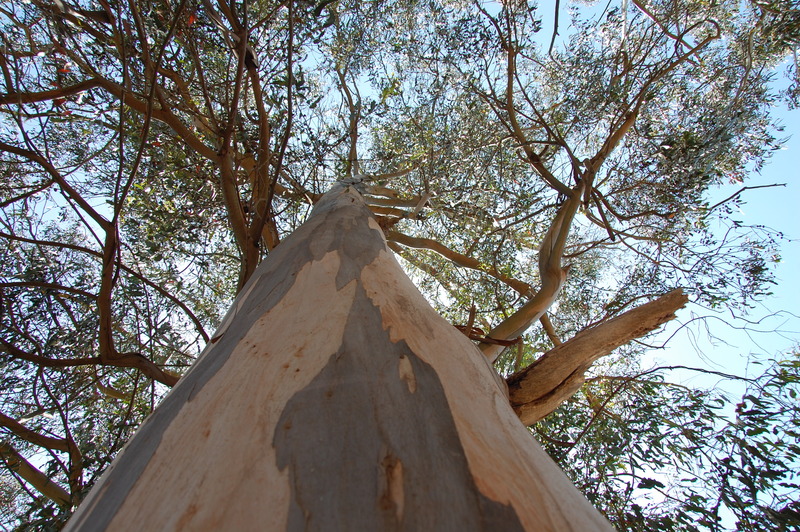 During my walk, I spied numerous succulents, as well as some beautiful (and unidentifiable by me) trees with bark reminiscent of the sycamore. Angel Island has a fascinating history. Although it is a California park today, at one time it served as an immigration point for nearly a million immigrants, most of whom were Chinese. Unlike European immigrants who passed through Ellis Island, however, the Chinese immigrants were detained until they could prove that they had family in the United States (a process that often took years). Angel Island was also at one time the home of a U.S. Army base called Fort McDawgell and served as a quarantine station to prevent the spread of illness to San Francisco. It was late afternoon when I returned to Fisherman’s Wharf, where I spent quite a bit of time at Pier 39 observing the resident colony of California sea lions. The sea lions, the majority of which are male, reminded me of some middle school students I know. 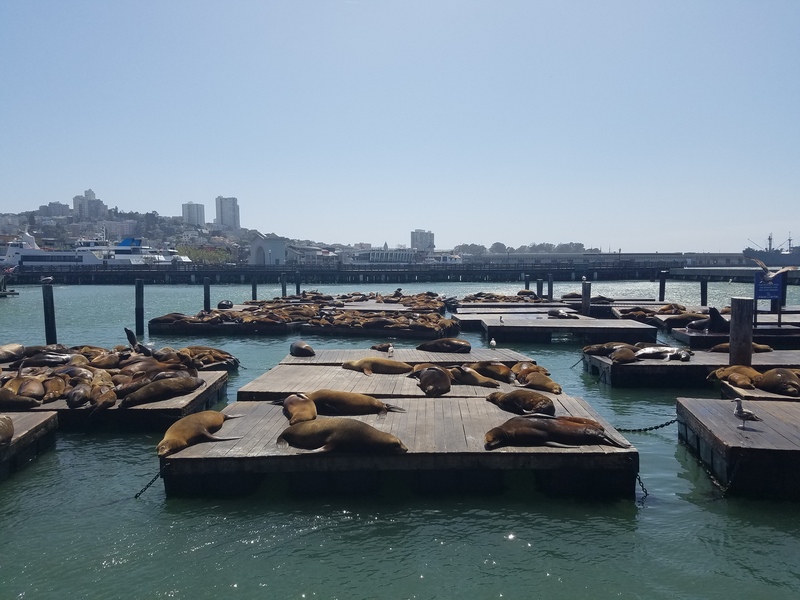 Although many napped in the sun, others jostled and pushed each other around and off the docks and some brayed loudly as if to say “look at me.” Sea lions have always been present in the bay, but using the docks as a haul out for sunning has only been occurring since 1989. Researchers aren’t sure what prompted the animals to begin using the dock as a habitat, but plentiful food and an absence of predators are two reasons that the animals stay around. 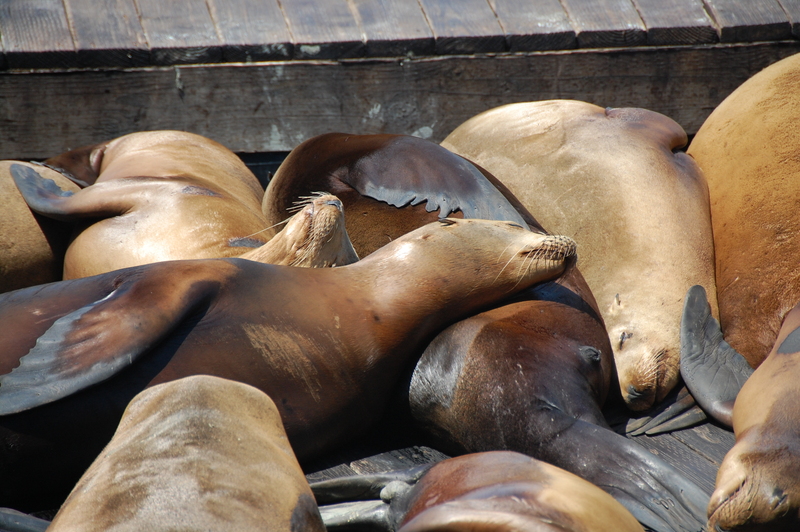 Yesterday nearly all the dock space was packed with wall-to-wall sea lions who crowded near each other as they slept. This behavior of seeking out physical contact is known as positive thigmotaxis. 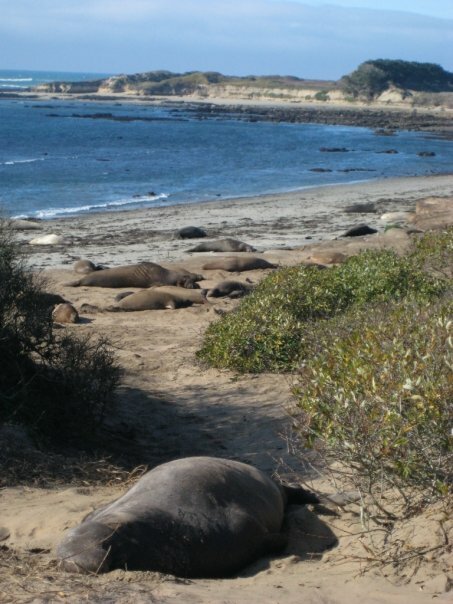 The sea lion numbers evidently fluctuate in response to food availability and mating season as many of the “bachelors” head off in search of a girlfriend. You can check out their antics on the Sea Lion webcam. Look who took over Pier 39! As I finish my writing, I think about the adventure ahead. I’ll soon be picked up soon by two scientists and driven to Santa Cruz, where we will board the Ocean Starr. I worry a bit about the rough seas and the likelihood of seasickness. I also wonder what it will be like to conduct night trawling. I’ve been assigned to the 8:00 p.m. to 6:00 a.m. shift; why is it that trawling is done at night? Are fish feeding at that time and more likely to be caught? 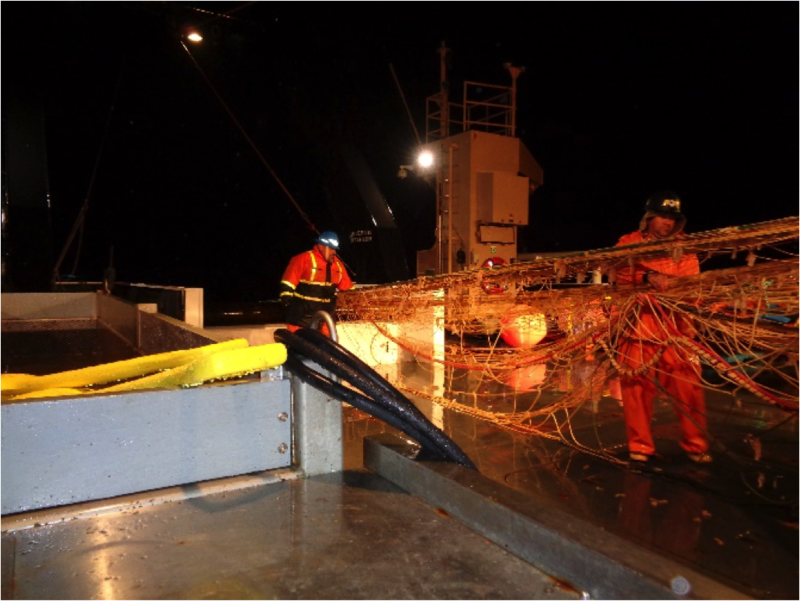 Does night trawling reduce by-catch (organisms that are caught unintentionally)? Or perhaps it is because you catch more at night? I guess I will soon find out. In the meantime, I better study the picture below so I can help identify the fish we catch! Which fish would you buy at the supermarket? The McArthur II took about six hours from leaving port in San Francisco to reach our first station at Bodega Bay. We arrived at Bodega Bay around midnight. Bodega Bay, along with the next three stations, Point Arenas, Vizcaino Canyon, and Trinidad Head, California, will be sampled at only one station location each as we move up the coast to reach our first transect line of nine stations off Crescent City, California (Latitude: 41 deg 54 min). Due to leaving port later than expected, the science team has dropped some of the sampling sites at the southern end of the cruise. Still we are sampling as we head north in order to get an enhanced survey picture along a north-south line. 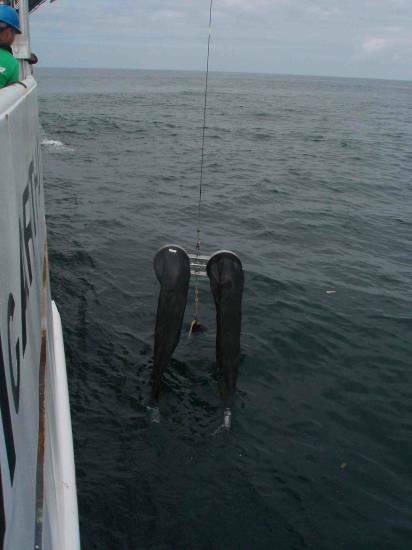 At the stations, we are dropping the CTD into the water column, using the vertical net, and the bongo net. 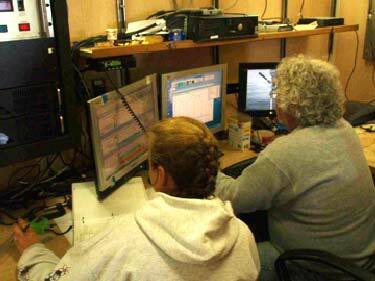 Jennifer Menkel and Lacey O’Neal observe the CTD deployment. 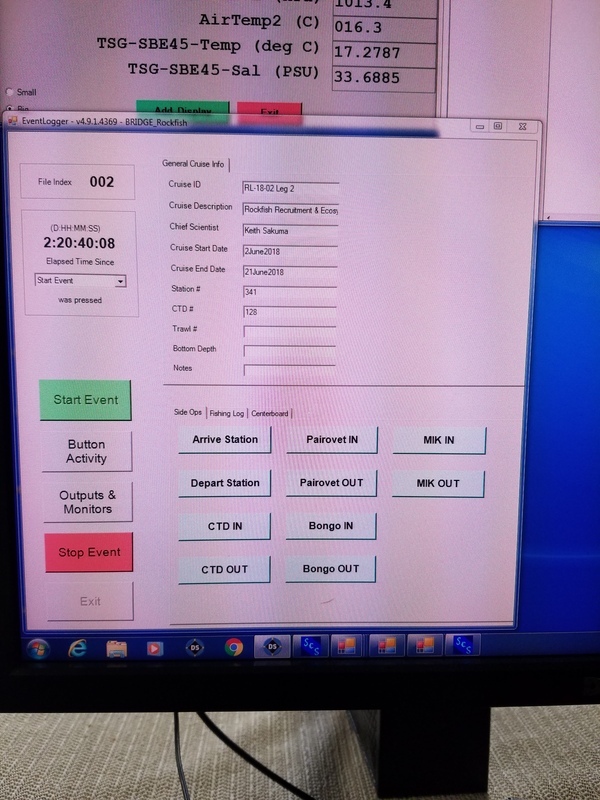 The left screen display depth sounds on three different frequencies, the middle screen creates graphs based on the CTD sensors, and the right screen shows live video feed of the CTD deployment on the fantail (back deck) of the McArthur II. 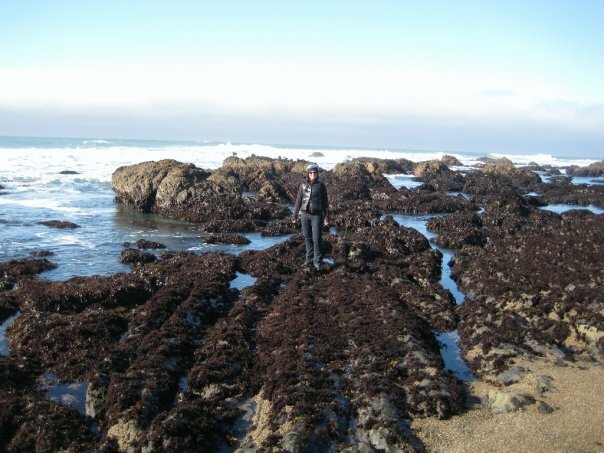 While I did not participate in the first sampling at Bodega Bay, my shift (read more about shifts below) began sampling at Point Arenas and then Vizcaino Canyon. Upon entering the dry lab, Jay Peterson and Jennifer Menkel, both of Oregon State University, Hatfield Marine Science Center (OSU/HMSC) in Newport, Oregon, were observing the data stream for the CTD on the computer monitors with McArthur II senior survey technician Lacey O’Neal. Communication is essential. The scientists are looking at the TV monitors for the CTD deployment outside, altimeter (measures the CTD’s height above the seafloor), depth below the surface, and communicating with both the ship’s officers on the bridge, who are navigating the boat, and crew who are working the winches. Everyone has to work together to ensure that the CTD is deployed and retrieved safely. Otherwise, it could potentially hit the ship, causing damage to the ship, crew, and/or CTD sensors. I am appreciating the emphasis on collaboration that occurs for the benefit and safety of the scientific research occurring on the ship. I will discuss the sample collection technique for the chlorophyll. The main purpose for measuring the chlorophyll is to determine the chlorophyll composition and suitability for single celled algae to develop. These single celled organisms are the basis of the food chain. By determining the amount of chlorophyll, you can look at the probability of organisms to develop at that location, such as plankton. Plankton succeed where there is enough light to allow photosynthesis to occur. Deni Malouf, a marine science technician from the U.S. Coast Guard, and I put on waders, boots, life jackets, gloves and hardhats. 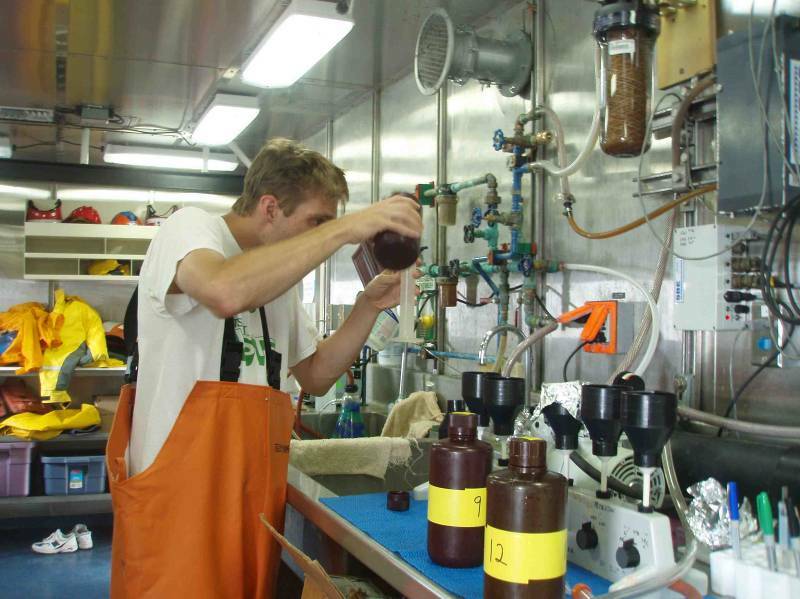 We headed out to the CTD to collect water samples from specific depths. After filling up brown bottles (which prevent exposure to sunlight) with water, we transferred the bottles to the wet lab to pour 100 mL through a filter that collects chlorophyll on top while allowing the water to flow through by utilizing a vacuum. This procedure is done while ensuring that the equipment, filters, and water samples avoid contact with your hands, thus contaminating the sample. After the water has been filtered the filter is placed in a centrifuge tube (vial) with tweezers, covered to avoid exposure to light, and stored in the freezer for lab analysis at a later date. The sample is covered to prevent exposure to sunlight. 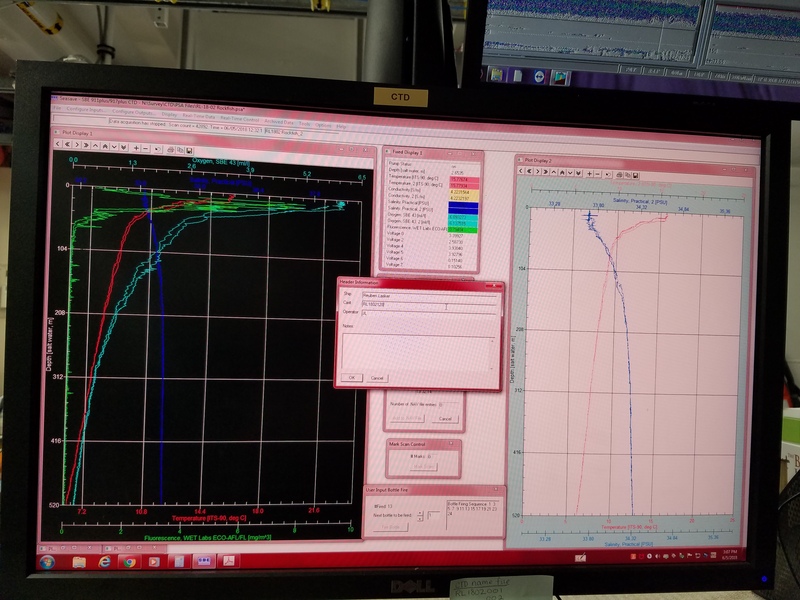 If not, sunlight could cause more chlorophyll to develop, which would be an inaccurate reading for how much chlorophyll was actually collected at specific depths in the water column at a sampling station. I am measuring a 100 mL water sample to collect chlorophyll on a filter inside the black cups in the wet lab. These containers have a filter that at the bottom. A vacuum draws the water through white tube, leaving the chlorophyll behind on the filter. The work conducted aboard the McArthur II, as well as other ships in the NOAA fleet, revolves around a schedule of watches (a watch is a shift). Crewmembers work on the McArthur II in four or eight hour watches. The time of day and length vary for different crewmembers. As for the science team, Bill Peterson, our chief scientist (cruise leader) from NOAA/ Northwest Fisheries Science Center (NWSC), Newport, Oregon, arranged us into 12-hour watches. There is a day watch and night watch. I am part of the day watch, which commences at 7:00 a.m. and ends at 7:00 p.m. You muster (show up) about a half hour before your watch begins so that the previous watch knows you are ready to begin work, and to assist as needed with the end of the previous watch. My watch is comprised of Jay Peterson, Jennifer Mendel, and myself. There is a lot of teamwork and cooperation within the watches. Even this morning, Deni Malouf, who had been working the night watch, stayed on for a portion of the day watch to assist me with the protocol for filling up the water samples from the CTD, for preparing chlorophyll samples, and for setting up the Niskin bottles on the CTD to be deployed at the next station. Dry lab- in the back of the O-1 deck (one of the floors on the ship above the waterline) where the computer equipment is situated. Used to monitor CDT deployment. 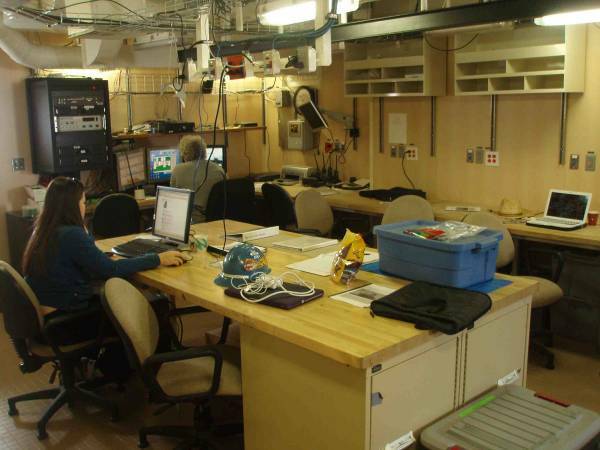 Wet lab-an indoor lab in the back of the O-1 deck connected where water samples are tested. Contains sinks, freezers, refrigerators, and science equipment. Vertical net- a net deployed vertically through the water column at one specific location. Has a weight on the bottom of it to maintain its shape on the way through the water column. Bongo net- a net for collecting organisms, that appears to look like a set of bongo drums. 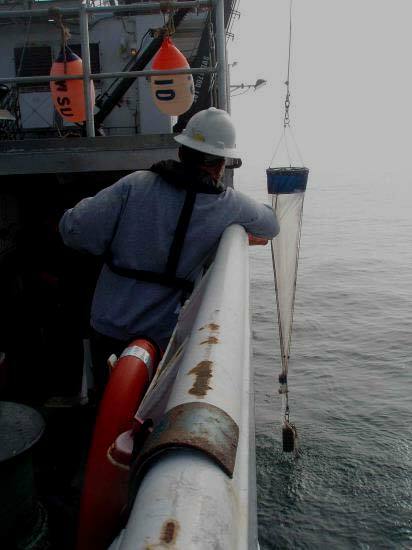 Attached to a cable and the J frame, deployed off the side of the boat, and collects samples as the boat trawls at a specific speed to maximize the collection.